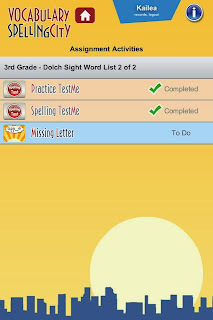 VocabularySpellingCity is an interactive learning tool. The premium membership offers lessons in writing, spelling, vocabulary, and language arts. These are done by the use of flash cards, games, and writing. The membership also has a progress tracking for the student that does grading for you. 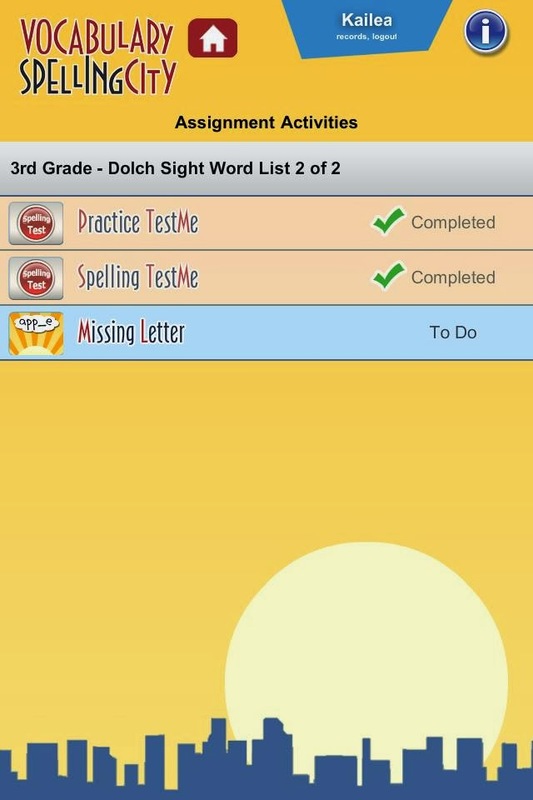 You are able to go in an assign work to your child in each of the categories and when they log into their account they can see what you expect them to do and as well as when (if you assign a due date). They also now offer free access to their app available on iPhone, iPod, Android, and Kindle. We used this program about 4 times a week. I went in at the first of the review and loaded up many different lists for Kailea to do. That way when Kailea logged onto her account she could choose what set of words she wanted to work with. The graphics and colorfulness of the site is great. I think it helps keep the kids attention so they are not bored with the look. It keeps it from being like a workbook in black and white. I was very surprised that Kailea enjoyed the writing sentences. She is very smart but she hates writing and hates using her imagination to come up with a sentence or story. So at first it was a struggle to get her to use that part of the program. We started her out doing the vocabulary of the words to make sure she knew what each of them meant. I hoped that the definitions would help her get an idea of a sentence too. She eventually got to doing it, then we discovered the app. If you knew Kailea you would know that if it has to do with her iPhone she will do anything to be able to have it in her hand. I downloaded the app to her phone and I was really amazed after signing it that she was able to use it on the go even without wi-fi. She started using it and writing sentences being able to use our surroundings out and about in the car to come up with a topic to write the word with. The games are also great because she was able to "play" on her phone but in reality she was doing school work. The picture to the right shows what she would see when she logged into her phone. Just like online she had a list of her tasks that she needed to do. We used this when we were on the go and she didn't have to ask me what she needed to do, she had it right there. VocabularySpellingCity Facebook page is a great way to keep up with updates and such. Also the site was a big hard to navigate and figure out at first. You need a good solid time slot as teacher to get on there and go through the help links and such so you can figure out how to add the lists and assign the work to the children. It is a lot of steps to take. I think it would be a good idea if they had lists that were sectioned off better and when you found a list you could assign it straight from that stop on the page. However, how they have it now is you have to upload it then go to a different area and assign it. It does take a lot of time on the teacher/parents part to get this started. Once the tasks are in place it is really for the child to navigate though. My daughter loves it and we will continue to use this program. I think we will get more use out of the app than the computer time though. It seems that you can do just as much on the app as you can on the site so it is just as effective. For under $30 a month for up to 5 kids you cannot beat that price for the different options of games and work they offer.